Am I the only one who thinks that Woo Tak sleeps a bit too much on the job? Dude, drink some coffee with your stereotypical donuts! Last week, I wondered how our three dreamers were connected. Was it the soldier? One of my theories was that it happened after one got saved but then I discounted it because Hong Joo’s mother was also saved in Jae Chan’s dream but she’s not having precognitive dreams (as far as we know). Even if we explain that away by saying that only Woo Tak was affected because his life was saved in the moment and not in the future like Hong Joo’s mom and he felt grateful etc etc, then why did Jae Chan’s dreams only just begin? Woo Tak began dreaming very shortly after he was saved yet Jae Chan’s dreams started years later. Why? What’s the trigger? Unlike Hong Joo who immediately recognized him as the man in her dream, Jae Chan had no such reaction the first time they met so I’m assuming that he only just started dreaming about her. Also, how did Hong Joo’s dreams start? Did someone else save her? But unlike Woo Tak and Jae Chan whose dreams appear to be limited to their savior, she dreams of many strangers so what’s her deal? Is she the index case and if so, why her? This week peeled back one of Yoo Bum’s layers. He didn’t hesitate to defend a rich criminal he knew had committed a despicable crime. And not just defend but put him back on the street. Everyone is entitled to a fair trial and I often wonder how defense attorneys argue the innocence of someone they suspect or know is guilty. Do they completely ignore the moral implications of helping a guilty person get off scot-free and simply focus on the law when they do their jobs? How do they sleep at night? Very well, I would have expected of Yoo Bum from what we’d seen so far. I mean, this guy breaks the law (for example, falsifying medical records and getting rid of evidence) to get his clients off. But instead of being the unfeeling, uncaring, nasty arrogant jerk we’ve grown to hate, we saw a different side of him behind closed doors. We saw someone disgusted by his client, desperately trying to wash his touch off his hands. So what’s his deal? We know he’s been scum since childhood but he started off as a prosecutor before becoming a defense lawyer. Did one unfair case put him on the other side defending rich, guilty clients? Because he seemed pretty mad when he accused the prosecution of dropping the ball. Or is this some kind of revenge for a case that went awry from his childhood that unfairly punished a loved one? Whatever it is, I’m betting that there’s more to his story. The main couple has a strange relationship where they apparently can’t have any privacy. They see each other in their private, intimate moments which makes for a pretty creepy relationship. It’s like they live their own lives during the day and spend their nights spying on the other person’s future, witnessing both tense and mundane moments. Is Woo Tak also in on this? Does he see Jae Chan on the toilet? Will he see him make out with Hong Joo? However, this was used quite conveniently this week when Hong Joo needed the killer stopped and mentioned the place and time hoping that Jae Chan would see it in his dreams and save her. I hope she also told him where Woo Tak’s bleeding body was so that he could send the paramedics to get him. On another note, is it just me or did they make it seem like prosecutors perform autopsies? 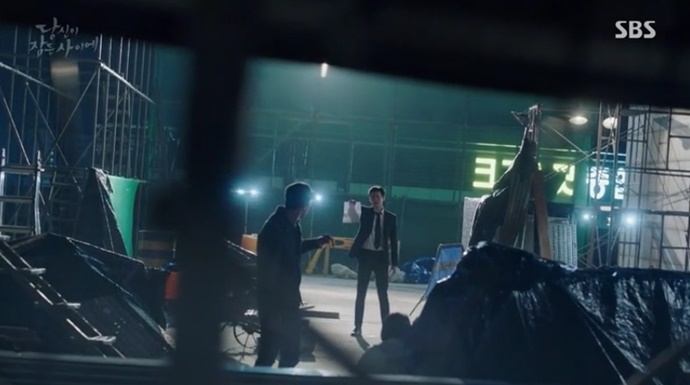 Jae Chan’s colleague wasn’t going to perform an autopsy on the victim, right? The man in the white coat was a medical examiner and he was going to do it while they witnessed it, right? Anyway, the storylines are getting a little too contrived but it’s still a fun ride. Hold up, I almost forgot to talk about something important we learned this week: Hong Joo’s job. It’s something I wondered about earlier and we learned why she works with her mom – she had a vision that she died on the job. And given the tight relationship she has with her mother, she told her and the older woman forbade her from returning to work. It makes sense because she knows those dreams are to be taken very seriously. But it’s not easy to ignore one’s true calling especially when it feels like one’s life is wasting away. Knowing that it’s not right to keep her daughter from living her life, Hong Joo’s mom enlists Jae Chan’s help in keeping her safe. So he helped her cross the street in front of her office building when her fear-gripped feet didn’t move and he saved her life when her job put her in direct contact with a killer. I think there’s so much left to unravel with this story. Like is saving someone’s life all there is to these dreams? Did she save his life before her father died? Did he know she (or “he” to him) was her savior when he returned her baseball? We didn’t get a lot of Yoo Bum this week but I’m more interested in him now that we know he hates his despicable clients. I can’t wait for more. Woo tak is the youngest brother of that soldier. Woo tak did say he has 2 other siblings and that he’s a spoiled kid (but he seems to be out of care with the empty fridge, which means he has a family problem). So the soldier killed the 2 fathers. The elder brother tried killing himself but saved by Jae chan. Hong joo saved them, but only Jae chan is affected. Jae chan has been the first person to change the future, by now, everyone with dreams are changing the future. Changing the future seems to bring possible problems, but if the 3 of them change the future, nothing bad happens. But, here is one where Woo tak didn’t get a dream. Oh, and Woo tak’s back story is so going to be interesting because he’s vibing dark aura since that robot vacuum cleaner case.